A new day, a new dawn, a new year! Hello lovely ones and happy happy New Year! So here we are on the first day of a New Year with a blank slate upon us for 2019, ready to create our year ahead. If you are feeling a little meh about setting New Year intentions and feeling like you have an energetic 2018 hangover then I recommend listening to my last solo episode of 2018: Completions and Closures -wiping the slate clean. 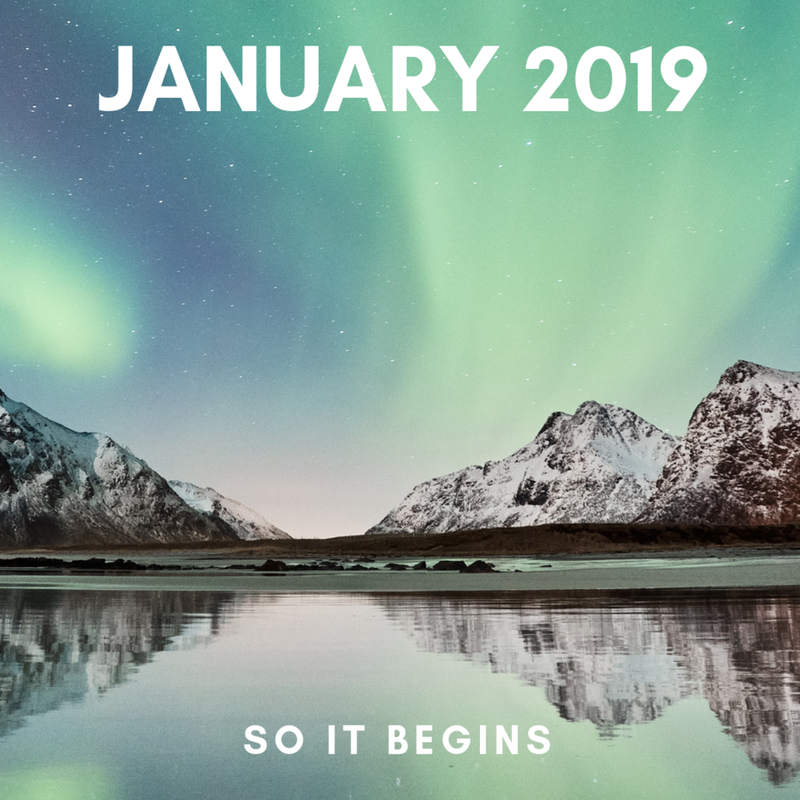 If you are raring to go for 2019 then I hope you are subscribed to my podcast Alchemy with Ambi as the first episode due to drop any day now is all about how best to plant the seeds of creation for this new year ahead. Finally, if you live in Los Angeles, or are visiting, then I hope you will join me for my first Soulstrology Soundbath of 2019, this Friday January 4th at Wanderlust Hollywood to celebrate the first New Moon of the New Year which just so happens to be a solar eclipse! Early bird tickets are available here. January 2019 starts with a bang with the first New Moon of the year being a partial solar eclipse in Capricorn on the 5th. Solar eclipses are like amped up New Moons which create a six month manifesting portal so with this Capricorn solar eclipse taking place in the first few days of 2019 we have a powerful manifesting window in which to set intentions for the year ahead and use the Summer eclipse season as a marker to check in as to where we are with our New Year intentions. Regardless of our sign Capricorn season will have us taking life a little more seriously. The day after the Solar Eclipse, Uranus turns direct, meaning all the planets will be in direct motion. This sets the scene for our start to 2019. A truly blank, slate and fresh start, with the assistance of a powerful Solar eclipse to shake things up and launch us into the New Year. This month the cosmos is asking us to get clear on what we want and to focus our attention as to how we are going to get what we want. We are called upon to be practical and focused. It is also asking us to start as we mean to go on. Because what we do now, the seeds of intention we plant with our thoughts, our intentions, our energy, our words and of course our actions, is setting the scene for the year ahead…. So the theme, the energy, the imprint of our 2019 begins, as we begin it. Which is why we need to begin it as we wish it to continue and play out. It seems obvious, but it is easier said than done. For many the bad habits and patterns of the year now gone, the subconscious patterns and behaviors, even the energetic hangover from 2018, can spill into the New Year and poison its clear waters. Of course this is not what we want but we need to be vigilant to not let our emotions cloud us and in doing so muddy the waters of 2019. Instead we need to be grounded like earthy Capricorn. Rooted, still, practical, logical and dare I say - a tad unemotional. Not meaning we dismiss our feelings, but we reset ourselves emotionally and rather than carry an emotional hangover from 2018, we wipe the slate clean and think about the kind of emotions we wish to experience throughout this next year. With this in mind I start this year as I mean to go on..
May we all start this year on the right note, for our highest good and the greater good of all! January 2: Sun conjunct Saturn in Capricorn. Powerful aspect to get focused and serious. Can have a heavy feel to it though. January 4: Mercury in Sagittarius trine Uranus (retrograde) in Aries. Positive aspect for thinking/communication. January 4: Sun in Capricorn sextile Neptune in Pisces. Harmonious aspect for creativity and practicality. January 8: Mercury in Capricorn square Mars in Aries. Tense aspect but can be very productive. January 11: Sun conjunct Pluto in Capricorn. Very powerful productive aspect but be mindful of power trips, yours or others! January 13: Mercury in Capricorn conjunct Saturn in Capricorn. Productive aspect but be mindful of not being too serious/being pessimistic. January 13: Jupiter in Sagittarius square Neptune in Pisces. Tense and tricky aspect which can be productive but is also a reality check. January 14: Mercury in Capricorn sextile Neptune in Pisces. Harmonious, flowing aspect, good for creativity. January 18: Venus in Sagittarius trine Mars in Aries. Positive, flowing, harmonious aspect. January 18: Mercury conjunct Pluto in Capricorn. Powerful aspect for thinking and communication, be mindful around over intensity. January 18: Sun in Capricorn square Uranus in Aries. Tense aspect, expect the unexpected feel, could be productive. January 20: Venus in Sagittarius square Neptune in Pisces. Tricky aspect, be mindful around love, creativity and finances and being realistic. January 22: Venus conjunct Jupiter in Sagittarius. Lucky, positive, flowing aspect! January 23: Mercury in Capricorn square Uranus in Aries. Tense aspect, can be productive, but watch out for communication/conflicts. January 25: Mars in Aries trine Jupiter in Sagittarius. Positive, flowing, harmonious aspect. January 29: Sun conjunct Mercury in Aquarius. Powerful aspect for thinking outside of the box and creative insights and downloads. January 31: Saturn in Capricorn sextile Neptune in Pisces. Flowing aspect, good for finding the fusion between creativity and practicality.